An important part of sifting through history is making deductions. Perhaps most the memorable segment from the documentary "Reflections On Ice: A Diary Of Ladies Figure Skating" is a montage of a half a dozen or so of Sonja Henie's contemporaries offering some rather veiled shade towards their former rival. Print interviews over the years have been far less complimentary. 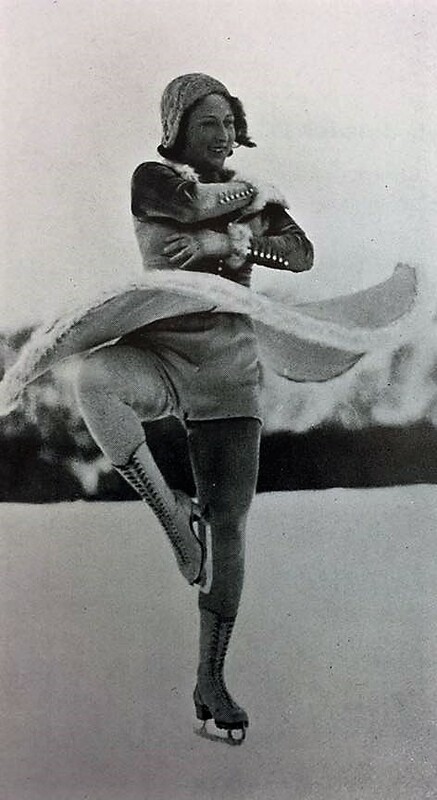 The recollections of Sonja's competitors have cast a less than brilliant light on the Norwegian skating sensation. Over the years, some critics have predictably cried "sour grapes!" but in digging even deeper into the subject - which I will do in an upcoming blog - I learned that the complaints of Henie's former rivals who lent their voices to that documentary certainly weren't the only ones. At some point, it became reasonable for me to deduct that Henie's rivals were telling the truth. One of the most women in that documentary was Austria's Fritzi Burger, perennial runner-up to Henie in the late twenties and early thirties. To say that Fritzi's competitive résumé was impressive is an understatement. She won two Olympic silver medals, four World medals and four European titles. Yet, she was only able to claim the European title once... in 1930 when Henie opted not to compete. Maribel Vinson once described her as "bubbly", yet Fritzi's disdain towards Henie in print interviews was palpable. While Sonja has taken serious flack for hobnobbing with Hitler at the 1936 Winter Olympic Games in Garmisch-Partenkirchen, Fritzi has largely gotten off the hook. Enter Carol Bergman's 1999 book "Searching For Fritzi". 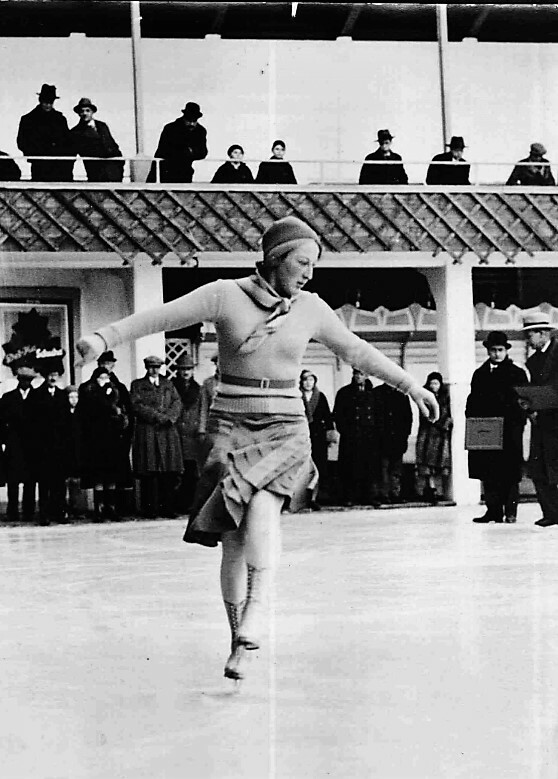 In happier times, Carol's mother Gerda Grätzer Poll skated hand in hand with her cousin Fritzi Burger on the glittering ice of the Wiener Eislaufverein in Vienna. Like skater Anne Frank, years later Gerda's parents Berthold and Nanette Grätzer were among many family members murdered in Nazi Concentration Camps. Both Gerda and Fritzi survived, but their lives couldn't have been any more different. "Searching For Fritzi" recounts Carol and Gerda's at times reluctant, at times determined quest in the nineties to reconnect with Fritzi and reveals several disturbing truths and questions about her story. Through her contact with Fritzi, Carol was able to deduct that Fritzi denounced her Jewish roots and went on to live a life of privilege in Japan during World War II with her businessman husband Shinkichi Nishikawa, a descendant of pearl tycoon Kokichi Mikimoto before moving to America and remarrying. After warmly connecting with and then being threatened by Fritzi, mother and daughter travelled to Vienna to revisit their roots. And then, a retired American soldier who met Fritzi in Japan provided the final, shocking puzzle pieces, allowing further deductions to be made about Burger's life during wartime. Wrote Bergman, "We do not know if the irony of her position in Japanese society troubled her in any way, or if she understood that the dignitaries and officers she entertained were the same individuals who were perpetrating the genocide against her own family in Austria. There is no evidence to suggest she tried to save anyone in her immediate or her extended family, though she would have been well placed to do so. There is no evidence to suggest she made use of the Mikimoto pearls as currency, though she would have been well placed to do so...I have asked myself often how I might have behaved during the Nazi reign of terror. And though it is impossible for any of us, I feel, to answer this question, I always come back to the available facts: Fritzi Burger was not like others in my family; she was privileged; she was rich; she lived in luxury and relative safety; she showed no remorse about the loss of family when we talked to her in America." The book left me astounded, angry and contemplating the concept of privilege. The privilege granted to Sonja Henie when her servant sat the autographed photo of Hitler on the piano of her Oslo home and her precious worldly possessions were spared. The reality that by hopping a steamship to America, Belita Jepson-Turner and her mother Queenie avoided the bombs that showered over Hampshire, the Anderson shelters, gas masks and meagre rations while many of her teammates from the 1936 Olympic Games contributed to the war effort. The privilege of the countless other European figure skaters who came to North America for safety and ended up making a pretty penny touring with American ice shows. The privilege of sportswriters who roll their eyes at bloggers for doing the same work they get paid to do for free, out of the love for the sport. The privilege of the anonymous SkatingFan1234's of the world who get their rocks off trashing skaters who can do things on the ice they could never dream of. The privilege of the white, rich, Christian, heterosexual males who largely dominate our ballots and dictate the world we live in. It's all a bunch of nasty business. I asked Carol if her perceptions of Fritzi had changed in the years since she wrote "Searching For Fritzi". She reflected that "they have shifted in an interesting way: I feel more compassion for her. Needless to say I also was angry and I still do feel angry. But I also know more about the history of her growing-up years. And as a young protégé what choices would she have had? None. Her parents made sure she was registered as a Catholic so she could skate. I have another cousin who survived the war years in Vienna as a registered Catholic. That's Dorrith in the book. I don't have any bad feelings about her or her parents. And if Fritzi had welcomed us as family I would have felt the same about her. There is no way we can judge such survival strategies so long as we own up to them. This is what we had to do... As a grown-up Fritzi did have more choices, of course, but she also still might have felt afraid or ashamed. And the fear of exposure in the midst of a war machine is traumatic. She carried the trauma of exposure with her to Japan, married into a family close to the Emperor, and then endured the bombing, albeit probably at a distance. Then a return to a bombed-out Tokyo must really have been difficult, a divorce, a young son, and so on. There remains the question of her great gift. She had a great gift. So did Picasso and he was a cruel misogynist. But he created masterpieces. I do separate the artist from the work." One doesn't even really have to dig too far in skating history to see that the pictures often painted aren't exactly how they seem. Is the answer to despise Sonja Henie or her father for their off-ice scruples while she was competing? No. Is the answer to despise Fritzi Burger for the choices she made in her life? No. Hate and fear are the omnipresent undercurrents that ruin our world. The most valuable thing we can do is call things as we see them, make our own deductions and realize that like both privilege and history, not all things are black and white or how they appear on the surface. "Searching For Fritzi" is currently available as a digital download for Kindle on Amazon.com for the incredibly low price of $2.99. You can learn more about Carol Bergman, her books and writing workshops on her website. She would also love to hear from readers! "Once someone reads the book it belongs to them," she explained. "Our conversation becomes part of our continuing study of history, and ourselves." I could not agree more!